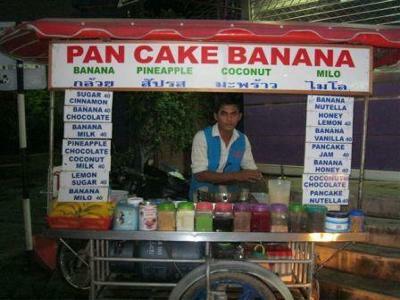 You will find street food such as fried chicken stalls, fruit stalls, sticky rice, BBQ corn, pancake seller etc.. throughout Phuket. Some stalls are fixed to motorbikes, some are on carts and some are carried on push bikes. 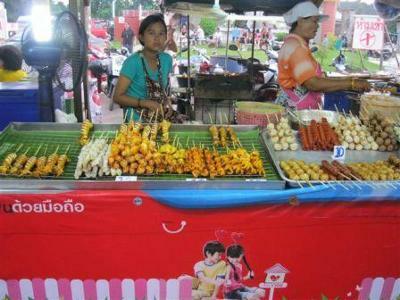 The street stalls sell snacks rather than full on meals, however there are also mobile stalls selling noodle soup or Phad Thai. To try the local food, head to the weekend markets where you can sample the real deal, fried crickets and all. 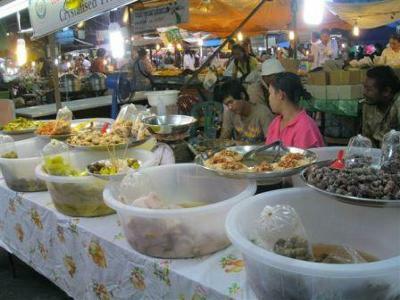 The weekend markets are Phuket’s largest markets and they are located just off Chaofa West Rd. The best way to see all the interesting sights around Phuket Town is with Phuket Heritage Trails. Their tours are designed to give you a closer look into the unique and true charms of Phuket Island, as well as exploring places known only by locals. A tour with Phuket Heritage Trails features either half day or full day programs and they can customise their programs to suit your particular interests. If you are interested in learning a little bit of history from true locals you can contact Phuket Heritage Tours via email at heritage.th@gmail.com or by phone +66 (0) 851 589 788. The morning tours will then take you to a local open-air food corner, where you will get to take in the local aromas and dishes available and learn about the ingredients used in the dishes.